Your sticker contains graphics that are lower than 300 dpi and may look blury at the selected size. Your sticker contains graphics that are lower than 300 dpi and we cannot make a transfer sticker with a low quality image. Optionally, we will fix your graphics for a extra charge or you can approve a low quality graphic. Optionally, we will fix your graphics for a extra charge or you can upload a higher quality image. Please wait while we save your design. Do not close this window or navigate to a different page. eLicensePlateFrames allows you to design your very own custom license plate frame! Choose from a huge selection of automobile and motorcycle frame designs in a variety of materials, including plastic, chrome, stainless steel and die-cast zinc. We offer wholesale prices on bulk quantities. Create your custom frame today! 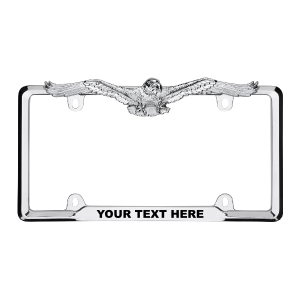 Show your love of animals with the Custom Eagle Chrome License Plate Frame. Easily adjust the text, font, and colors to fit your needs using our online design tool. This personalized frame makes a great gift, is easy to install, and is made from durable, sturdy plastic that will not rust. The frame fits most 6” x 12” standard auto license plates. Custom lettering is made with vinyl decals. We recommend checking your local laws to ensure that the style of the Custom Eagle Chrome License Plate Frame is legal in your state. Some states have special laws that may limit what parts of the plate can be covered or obscured by a license plate frame. I saw this frame on the car in front of me and had to have it! (I love Jesus AND cheese!) It was pretty easy to customize a frame on the site. I can’t wait to get it on my volvo! My husband is a firefighter so I got him this frame as a gift. He loves it! It’s very high quality and the edge of the frame as well as the screw covers are reflective. I love my new frame! The white vinyl lettering match the daisies and really help them pop! Order custom license plate frames at elicenseplateframes.com. Use our frame designer tool to create the perfect frame. Quantities are available from 1 to 10,000+.